Incheon International Airport has been named the best airport in the world for the 12th year in a row in the Airport Service Quality Awards. 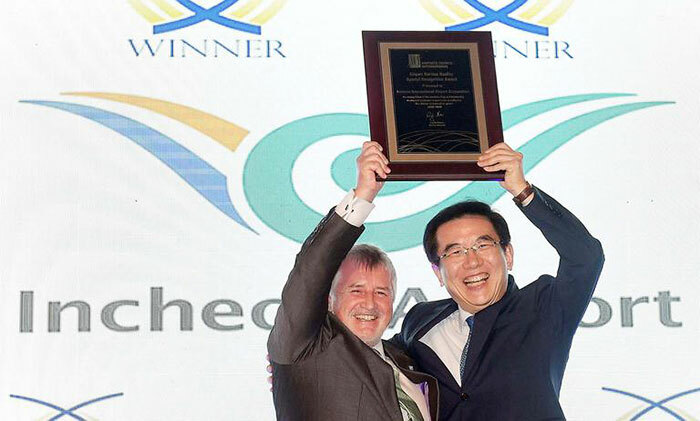 The awards event was held in Mauritius, an island nation off Africa's east coast, on Wednesday as part of the Airports Council International's annual meeting. Incheon ranked at the top in three categories -- best airport in the Asia-Pacific region, best airport handling over 40 million passengers per year, and best airport handling 40 million passengers or more per year in Asia-Pacific. Overall, Incheon scored 4.994 out of five points to be named the best airport in the world for the 12th year running since 2005, only four years after it opened. The ASQ survey rates airports based on customer satisfaction in 34 categories including friendliness, cleanliness, convenience, access, service and facility management. For the latest evaluation, it conducted one-to-one surveys of 550,000 passengers at 284 major airports all over the world last year. The ACI also gave a special award to Incheon for making a significant contribution to improving the quality of international airport service. Incheon Airport has decided not to participate in the ASQ Awards any longer, although it will continue to receive evaluations unofficially. What Makes Korean Airports Stand Out in the World?